1. Before applying, remove loose and rotted wood. 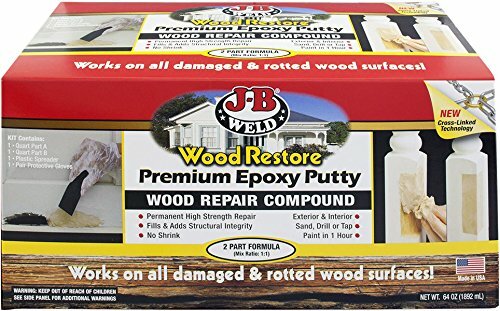 J-B Weld recommends that you seal and solidify the rotted wood surfaces with J-B Weld Wood Restore Liquid Hardener or Premium Liquid Epoxy and then follow these easy steps. 2. With provided gloves on, scoop out equal amounts of the required amount of the Part A and Part B Premium Epoxy Putty. Mix ratio is 1:1. 3. Mix thoroughly by kneading with the spreader or gloved fingers until a uniform color appears. 4. Apply to surface to be filled or repaired. Press in the material firmly, sculpturing and contouring to the desired surface appearance. Allow to cure. Finish with sanding using medium followed by fine grit sandpaper. *For best results dampen the material for easier mixing and application achieving a smooth appearance of the cured compound. Remove any excess material before hardening begins to reduce excess sanding and finishing.